The two numerically-dominant ecotypes of the marine cyanobacterium Prochlorococcus partition the surface ocean niche latitudinally, with the eMIT9312 ecotype dominant in the 30N-30S region and the eMED4 dominant in the higher latitudes. These ecotypes can account for 25-50% of primary production in open ocean ecosystems, but this percentage is dependent on which ecotype dominates. The relative abundance of the two ecotypes follows a log-linear relationship with temperature, with the transition point from eMIT9312 to eMED4 dominance occurring at ~18C. From these descriptive data, it has been hypothesized that temperature is the primary driver of relative abundance of these two important ecotypes. But their contribution to primary production appears to be independent of temperature, suggesting that temperature regulates ecotype dominance through photosynthesis -independent mechanisms. To test these hypotheses in the field, we plan a series of field and laboratory studies that will investigate the impact that temperature change has on the abundance of the two ecotypes. Two cruises in the North Pacific will trace the transitions from the eMIT9312- to eMED4-dominated regions, with one cruise during the winter and the other during the summer period. We hypothesize that the ratio of ecotype abundance will move latitudinally in response to the latitudinal shift in temperature gradient: migration of the 18C isotherm northward in the summer will be matched by a similar migration of the 1:1 ecotype transition point. Multiple crossings of the 18C isotherm are proposed, and the summer cruise will follow the isotherm to the Western US coast. 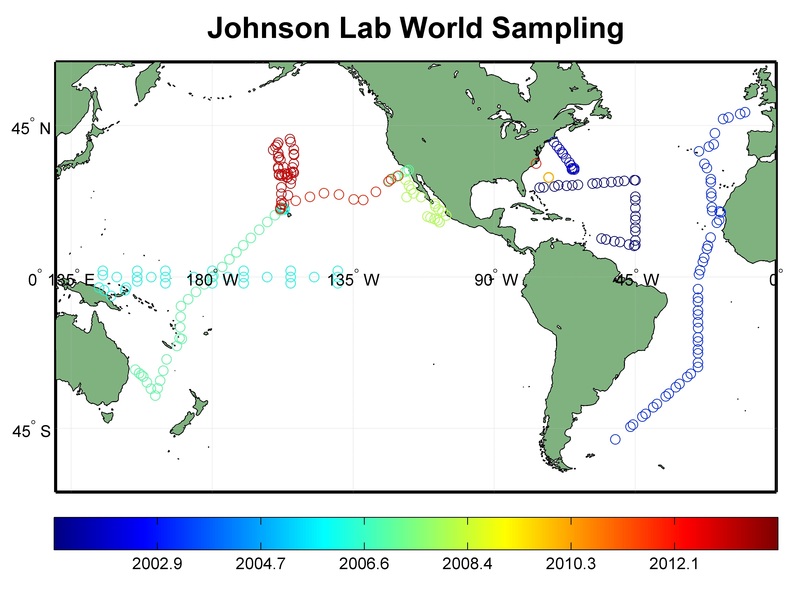 Other environmental variables such as nutrient concentrations, light/mixing depths, virus based mortality, which may impinge on the relationship between temperature and ecotype ratio, will be assessed through a series of multivariate analyses of the collected suite of physical, chemical and biological data collected during the cruises. The seasonal comparisons will be complemented with on-deck incubations and laboratory competition assays that, for the first time, will formally establish the fitness coefficients of the two ecotypes as they relate to temperature. The latitudinal shifts of the temperature gradient and ecotype ratios during the seasonal warming may share common features with the shifts associated with warming of the high latitudes as a consequence of climate change, and therefore our analyses will contribute important biological parameters (e.g. abundances, production rates, temperature change coefficients) for modeling biological and biogeochemical responses to climate change. Click here for more information. 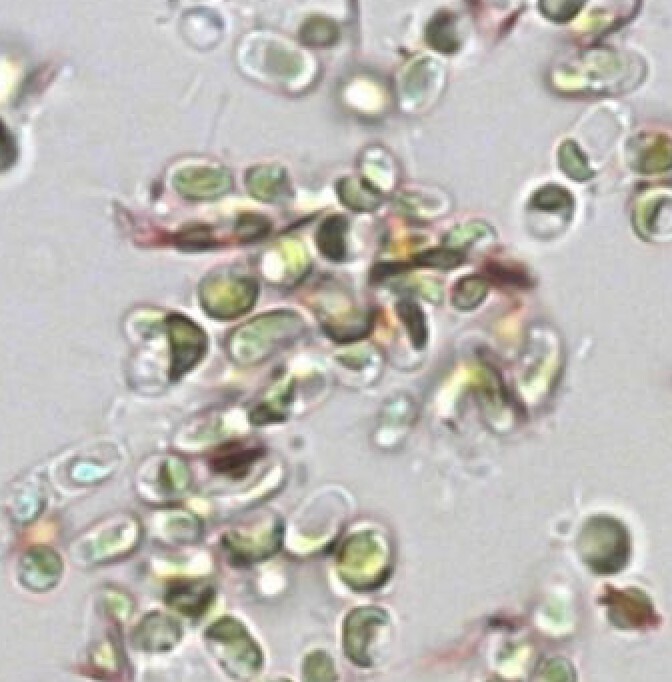 Microalgae (phytoplankton) have emerged as a key technology in developing next generation, reduced carbon biofuels. 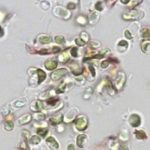 Specifically marine microalgae, which do not require freshwater or agriculture land and which also produce commercially valuable protein that can be used for animal feed, have been shown to be economically viable and to reduce carbon emissions. Our consortium, is composed of seven university partners from around the country. In addition to extensive university laboratory infrastructure and equipment, a second generation, newly constructed six acre pilot facility located in Kona, Hawaii is poised to test and optimize all aspects of the commercial production of marine microalgae for fuel oil and animal feed production. Using this unique suite of resources that also includes over 90 scientists and engineers, the Consortium has developed a research and development project that is focused on optimizing processes that have a quantifiable impact on yield, capital expenses, operating expenses, energy consumption, and/or carbon footprint. The optimization includes three major themes (1) developing algal strains that are thoroughly characterized (genetically and physiologically) for all aspects of the production process (2) demonstrating performance at the pilot scale and (3) improving the design and engineering of the process or apparatus – until sustained performance values are equal to or exceed our present capabilities. These optimization efforts are focused on six commercially critical areas including: (1) feedstock supply – strain development, (2) feedstock supply – mass cultivation, (3) feedstock logistics – harvesting and dewatering, (4) feedstock logistics – extraction, (5) conversion/production – fuel synthesis and (6) conversion/production – co-products (animal feed). The culmination of this project will be the delivery of a Design Report, including cost and life-cycle analyses, for a commercial-scale (1,000 ha), fully integrated algae-to-oil process based on the technologies. 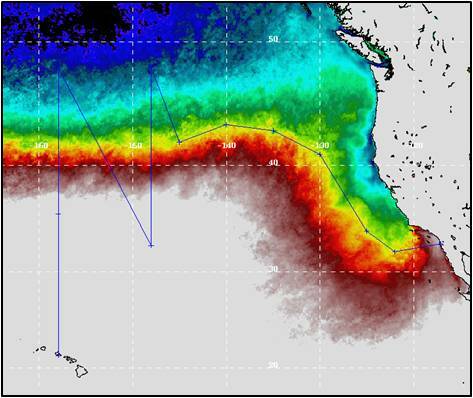 The design will be based on results of operational data gathered from the Kona Pilot Facility over a three year period that has been optimized through a comprehensive suite of experiments, modeling and process integration. This Design Report will constitute the basis for an important decision gate in the commercialization process of microalgae as a source of fuel oil and animal feed. Click here for more information. Carbon dioxide is rising at ~3% per year in the atmosphere and oceans leading to increases in dissolved inorganic carbon and a reduction in pH. 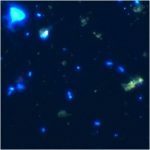 This trend is expected to continue for the foreseeable future and ocean pH is predicted to decrease substantially making the ocean more acidic, potentially affecting the marine ecosystem. However, coastal estuaries are highly dynamic systems that often experience dramatic changes in environmental variables over short periods of times. 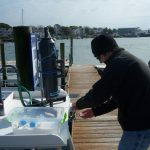 In this study, we are measuring key variables of the marine carbon system along with other potential forcing variables and characteristics of the ecosystem that may be affected by these pH changes. 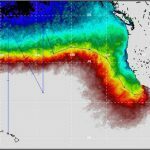 The goal of this project is to determine the time-scales and magnitude of natural variability that will be superimposed on any long term trends in ocean chemistry. Our long term goal is to understand this variability and to make management recommendations for increasing ocean acidity. Click here for more information. 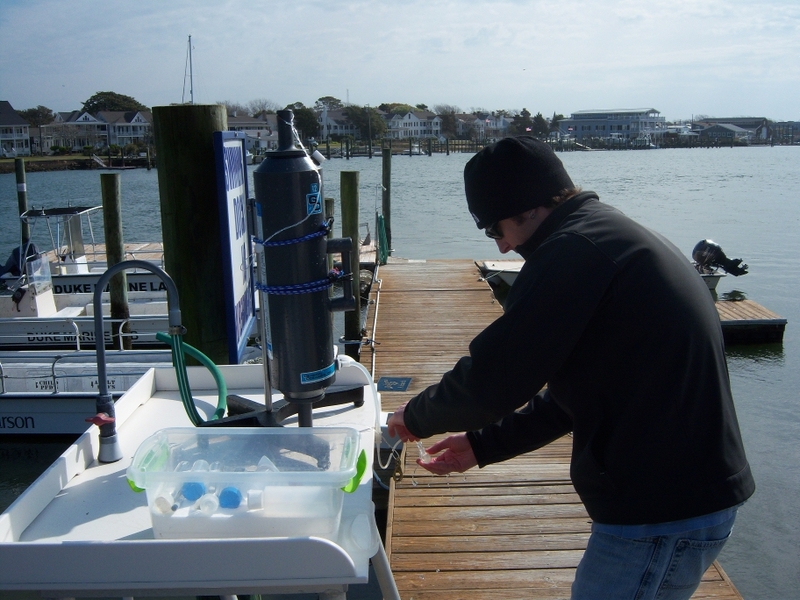 The Environmental Cytometry Facility is a multi-user facility managed by the Johnson Laboratory at the Marine Laboratory of the Nicholas School of the Environment at Duke University. The Facility is available to external users and was made possible through generous support of the US-NSF (#0526462, #0959630, #1031064). Click here for more information.